Gastropub in London Fields. 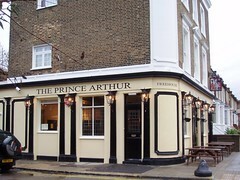 Previously run by the ETM Group, but according to the Feb/Mar 2015 London Drinker it was taken over by the Gorgeous Pubs chain in October 2014. We haven't visited since the change of management, so some of the information below may be out of date. On Ewan's November 2007 visit shortly after work, the pub was fairly quiet, but this is no doubt due to its location on a residential street just north of London Fields park: at other times I've been past (for example, a Sunday afternoon), it's been completely packed. The bar is opposite the main entrance, with the spaces for seating stretched around to either side. The place is cosy, tastefully appointed with plenty of wood, and has friendly bar staff. Undoubtedly one of the strengths of the pub will be its food. Although I wasn't able to sample anything on my brief visit, if the quality of the food at its sister pubs is any indication, it will surely be worth visiting sometime for a meal. Mains range from £10 upwards; they do a Sunday roast (including nut roast option) for £12.50. An anonymous visitor (October 2008) informs us that the head chef is "amazing". There is a small well-selected range of draught beers, including an offering from the Meantime brewery and a very well-kept pint of Deuchars for £2.60. Last visited by Ewan, November 2007. Prices verified at that visit. Opening hours taken from the Prince Arthur website, January 2015. Last edited 2015-01-30 12:42:39 (version 20; diff). List all versions. Page last edited 2015-01-30 12:42:39 (version 20).